Claiming the spot for this week’s Member Spotlight is Paseo artist and Paseo Arts Association board member, Terry Clark! 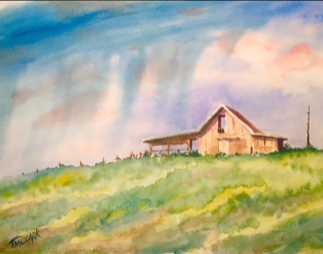 Terry creates evocative watercolor works inspired by the colorful skies and beautiful scenery observed in New Mexico and across the Great Plains. “Transparent watercolor is perfectly suited for capturing those dynamic, challenging skies, determining the shapes and colors and moods of the dramatic prairies, mountains, deserts and mesas, and its effects on humans.” No wonder he has been selling and exhibiting his art in the Paseo and Santa Fe, New Mexico for fifteen years! “How can you live in Oklahoma and the west and not be awed and influenced by it?” Terry asks. A member and former director of the Oklahoma Journalism Hall of Fame at the University of Central Oklahoma, Terry previously worked as a freelance writer and newspaper journalist. Having served as department chairman at UCO for a number of years, he carries 27 years of experience as a professor under his belt, teaching everything from photography and editing to writing and blogging. “Photography and journalism—composition, light, attention to specific detail—influence my art,” Terry says. Having been exposed to art all his life by his father, a landscape and portrait artist, Terry began his own art career about twenty years ago. Over the years, Terry has learned many valuable lessons. “Make your art often, no matter what kind. Experiment. Take Risks. Don’t be afraid to fail,” he advises. Terry recently became a resident artist at Paseo’s In Your Eye Gallery. “Meeting and learning from these other artists, and being a part of the gallery has been a long-term goal in my artistic journey,” Terry says. Find Terry’s work in a solo exhibition at In Your Eye Gallery beginning April 6!